Stumble It Recommend current page at Stumble Upon. With these additions o.yeswap.com now hosts 30 bookmarklets. With so many, I decided it was time to organize the page a bit. I’ve grouped the bookmarklets into four categories; Bookmarking, RSS, Page Info, and Tools and added top and bottom menus with links to each category. I’ve also updated the bookmarklets page with a bit of PHP that sets the page title to the name of the bookmarklet that you clicked. This means that when you save them in Opera Mini, the bookmark title will be pre-populated with a descriptive name instead of just “Bookmarklet”. This should eliminate the need to edit the title. Here’s how to add bookmarklets to Opera Mini. Click one of the bookmark links. When the page reloads, press # then 7 to bookmark the page in Opera Mini. 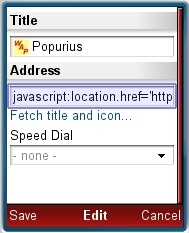 Edit the bookmark address by removing “http://o.yeswap.com/?” from the beginning and save it. The top image shows the bookmark editing window with the portion to delete highlighted. Visit the page that you want the bookmark to act upon. Immediately after the page loads go to Bookmarks and choose the bookmarklet. Set up your frequently used bookmarklets as Opera Mini Speed Dials so that you can launch then with two clicks, * + the bookmark number. I’ve really only tested these bookmarklets in Opera Mini 4.2, readers tell me that they also work in recent versions of Mobile Internet Explorer, Palm Blazer and Opera Mobile. With Opera Mobile bookmarklets only work if you turn off the option to open bookmarks in a new window. Quick del.icio.us Post Post the current page to del.icio.us with no tags but no form to fill out either. Add to Google Reader Add current site’s feed to Google reader. Doesn’t work with some sites! Add to Bloglines Add the current page’s feeds to your Blogline’s subscriptions. Google Info Links to everything Google knows about the current page; description, incoming links, related pages, etc. Wayback Machine View old versions of the current page at archive.org. Google Translate Translate the current page to English from Arabic, Bulgarian, Catalan, Chinese (Simplified), Chinese (Traditional), Croatian, Czech, Danish, Dutch, Filipino, Finnish, French, German, Greek, Hebrew, Hindi, Indonesian, Italian, Japanese, Korean, Latvian, Lithuanian, Norwegian, Polish, Portuguese, Romanian, Russian, Serbian, Slovak, Slovenian, Spanish, Swedish, Ukrainian or Vietnamese. Highlight Links Highlight links with a yellow background. Makes links identifiable in Bloglines Mobile. This entry was posted in Opera Mini and tagged bookmarklets, Mobile Internet Explorer, Opera Mobile, Palm Blazer by Dennis Bournique. Bookmark the permalink. can u please make a script which can add some cookies on the opera mini. What problem are you trying to solve? I can’t think of any use for a bookmarklet to add cookies to a browser. Thanks a lot for o.Yeswap.COM. 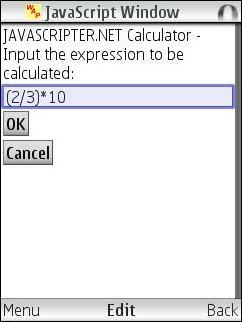 You might be interested in how i managed to edit the Calculator bmlet to have it working at my vodaphone 533 ? Well, could not use the editor of my phone for that because of the length of it. it would be saved as a bookmark though. Got it synchronised using Opera Link and in the web interface did do the edit easy enough. Reading part 3 of using the speeddials: i saw something peculiar. In OM 4.2 the * is used, not the #, to get the number of speeddialing. although I am making myself the same mistake too often. Something that could really make me very glad, is a bookmarklet to check links with siteadvisor or domaintools. Is that a realistic idea? Thanks for the heads up. I fixed the #/* typo. Try using the Web of Trust bookmarklet as an alternative to Siteadvisor. I’ll see if I can make a SiteAdvisor bookmarklet. I discovered that you can use the ‘Linkify’ bookmarklet to help you click the next page on Google Image Search classic mode when you are in mobile view on Opera Mini. I couldn’t get Linkify to work when I was writing the post. I must have been doing something wrong as I just tried again and it works perfectly. I’ve added it to http://o.yeswap.com. Thanks for reminding me about Linkify, this is a very useful bookmarklet. I use this bookmarklet mainly on the Yahoo Wap Messenger page. When i receive a link from my friends, Opera Mini 4.2 treats the link as text so if i want to check that link i have to use the “Linkify” bookmarklet . Is this bookmarklet work for you?